Ben Mackey's third spell with Leamington has come to an end. Leamington’s striking options have been severely depleted with Ben Mackey and Rob Ogleby both leaving the club. Mackey finished top scorer for Brakes last season, ending the campaign with 23 goals despite being relegated to a bit-part player for much of the second half of the campaign. The former Racing Club Warwick striker was known to be frustrated at his lack of opportunities and Holleran said a parting of the ways was best for both parties. He said: “After a conversation with Ben we both decided it would be best for us to go our separate ways. “For him to come back the way he did last season and score the number of goals he did was superb. Ogleby’s departure is another body blow to Brakes’ attacking resources, with the Coventry City Academy product having scored some crucial goals in an injury-hampered campaign. “He was a massive influence around the place, a great character, and he will be sorely missed,” said Holleran of the striker who is relocating to London. Coach Ian King is another to be departing the Phillips 66 Community Stadium having taken up a first-team coaching role at Worcester City. 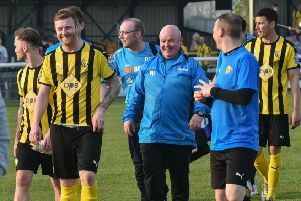 King initially helped out Holleran in a scouting role before undertaking coaching duties and the Leamington boss said his departure should prove mutually beneficial. “Ian has been offered a role at Worcester which he has decided to take up. “I wish him all the best as he progresses with his coaching career and thank him for all his efforts for us both on the training pitch and on match days. Joe Magunda is staying at Brakes, however, joining Tony Breeden, Jamie Hood, Richard Taundry, Connor Gudger and Jack Edwards in committing for another season.